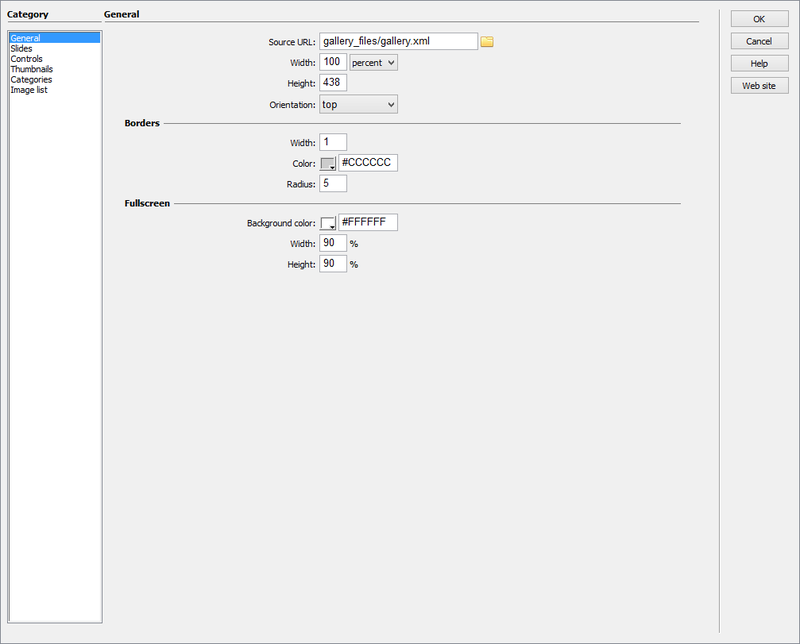 HTML5 Slide Gallery is distributed as an Adobe Dreamweaver extension, packed as a file, named JQSlideGallery.mxp. Read more in the online help. HTML5 Slide Gallery is an excellent and easy way to showcase your images at your site pages in a beautiful and modern interface. Slide Gallery is powered by jQuery and it has clear and comprehensible Wizard, you can easily set up, change appearance and edit the content of the gallery without digging into CSS files or code! So you don't need to be an expert in web design and to know programming languages to add professionally looking gallery to your site. You can change the layout of the component to make gallery scroll images horizontally or vertically and place thumbnails panel and categories list at the top and bottom or at the left and right sides. Just insert the gallery into your page and change parameters through Wizard according your design to match the site theme. HTML5 Slide Gallery has a flexible size, you can set 100% width, so the gallery will be stretched across the entire container and all the gallery elements, like categories list and thumbnails panel will be aligned and position accordingly. You can hide categories list, thumbnails panel and of course controls. Add the description that can be formatted using HTML to your slides and it will be shown in an animated popup by a mouse click on an info icon. Gallery has fullscreen and slideshow modes with different parameters to customize, including animation easing effect, duration and delay of the transition. Component is fully browser compatible, and will work on iDevices like iPhone and iPad! More over gallery is using hardware acceleration, which improves performance and making animation smoother on mobile devices. Component is ready to work as soon as it appears on a page and is fast to respond. The installation package contains Dreamweaver extension, providing you the ability to easily create high-impact, HTML5-powered galleries, all in Dreamweaver CS3, CS4, CS5, CS6, CC 2014, 2015, 2017 and CC 2018. Using the user-friendly user interface, you can adjust all colors, fonts, sizes, spacing and wide range of options including more than 100 parameters that you can adjust according to your taste. You can easily create necessary slideshow using gallery structure editor. Through the gallery editor you can add or remove categories and slides, move them up, down, or add the description. Width can be set to 100%, which allows you to show the photos stretched across the entire container or to shrink the item so that it can be viewed entirely without any cropping. The fullscreen option expands the gallery to fill the available browser space. Gallery can have landscape or portrait layout. Categories list and thumbnails panel can be placed horizontally (above or below) or vertically (left or right) of the main slide. Gallery can be divided into many albums. Images can be set to rotate automatically, with a timer line to show the time remaining until the next image is displayed. You can change easing effects, duration and delay of the transitions and set loop option. You have the option to hide and show on hover the arrow buttons, hide timer line, categories and even thumbnails. Installation package contains Dreamweaver extension. 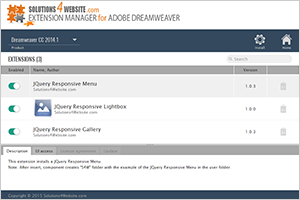 Dreamweaver extension allows you to easily create HTML5 gallery. Extension has user friendly interface.